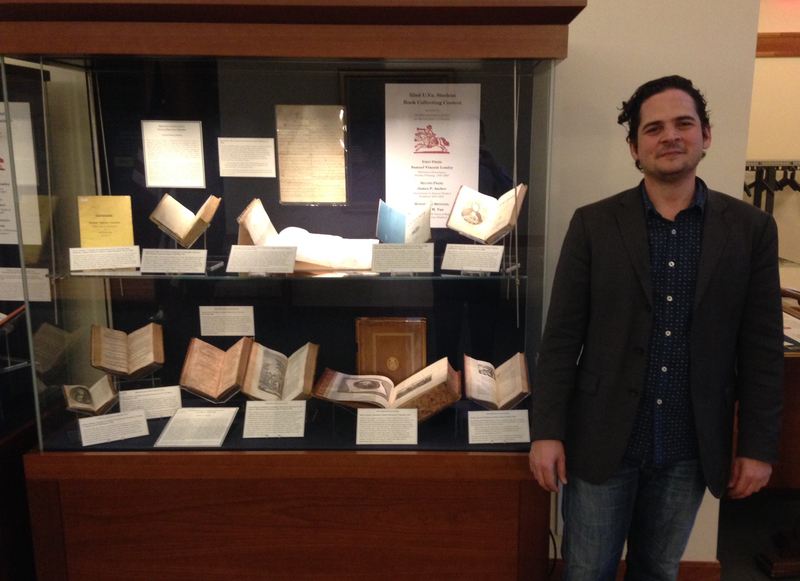 First prize winner Samuel V. Lemley with selections (top shelf) from his collection of Sicilian printing. Winners of the 52nd U.Va. 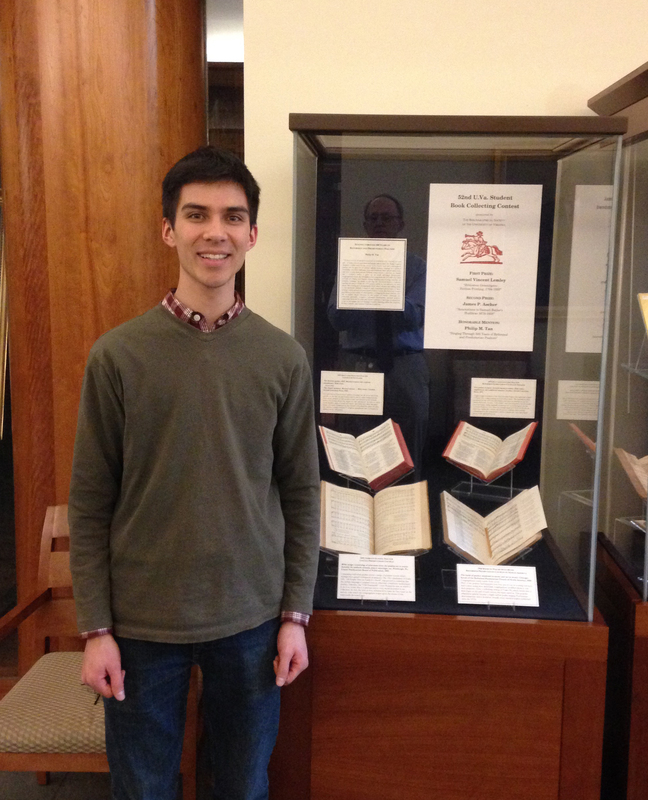 Student Book Collecting Contest were announced at the Bibliographical Society of the University of Virginia’s annual meeting on Friday, March 23, 2018 in the Auditorium of the Albert and Shirley Small Special Collections Library. The competition, sponsored by the Bibliographical Society, is a tradition dating back to 1948. It offers all U.Va. students a chance to showcase their personal book collections, and to win substantial cash prizes as well. Highlights from the winners’ collections were exhibited in our first floor exhibition gallery. A closeup of two mid-19th century Sicilian imprints. First prize was awarded to Samuel V. Lemley, a Ph.D candidate in the Dept.of English, for “Biblioteca Genealogica: Sicilian Printing, 1704-1893.” Lemley’s collection “offers a representative sample of Sicilian printing and ephemera from the 18th and 19th centuries, a period in which my maternal ancestors lived in the Sicilian provinces of Palermo and Agrigento. The chronological limits, 1704 to 1893, reflect the years for which genealogical records (births, baptisms, and deaths) for the Militello and Marchese families survive: Gabriele Militello, my earliest documented ancestor, was born in Bivona in 1704; my great-grandfather, Pietro Marchese, was born in Pollina in 1893. These are the genetic bookends of my Sicilian family tree and the figurative bookends of this collection.” Lemley will represent U.Va. in this year’s National Collegiate Book Collecting Contest. 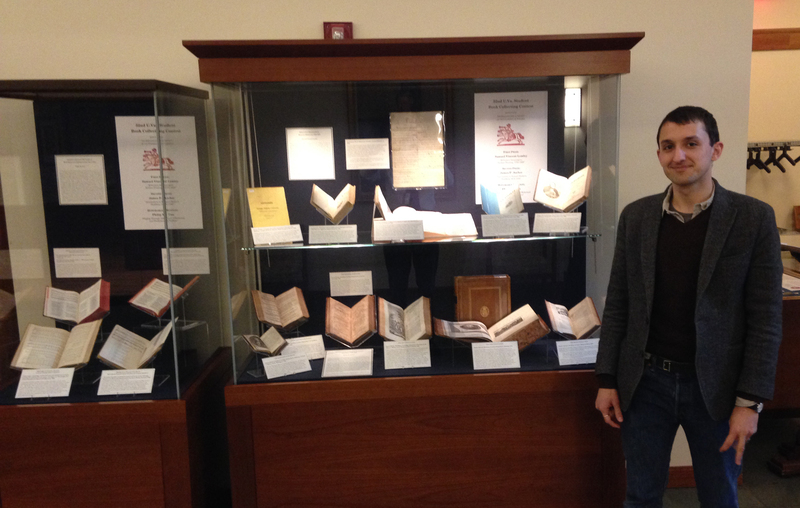 James P. Ascher, second prize winner, with selections (bottom shelf) from his collection of annotated editions of Samuel Butler’s Hudibras. 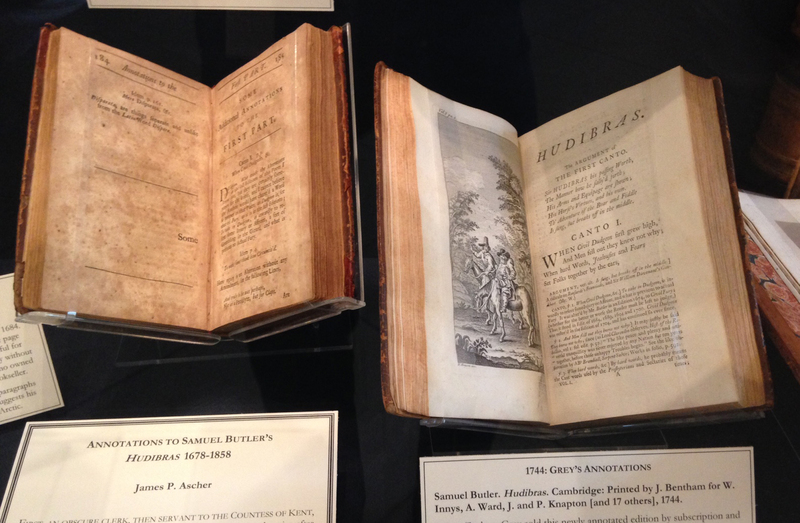 The 1684 and 1744 annotated editions of Samuel Butler’s Hudibras. 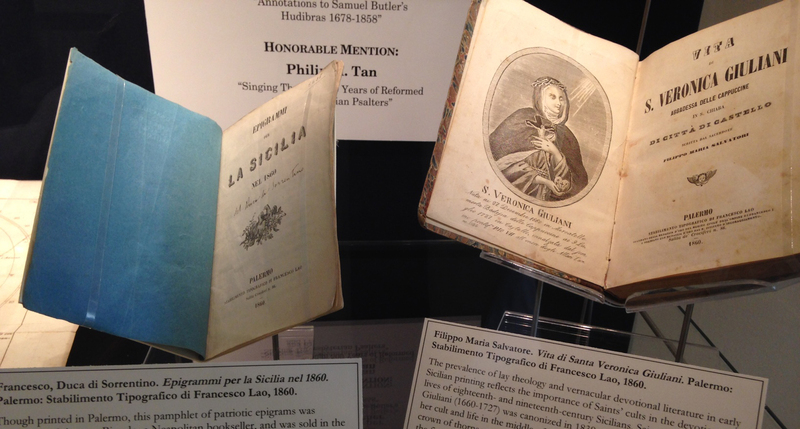 Philip M. Tan with selections from his collection of psalters. This entry was posted in General and tagged Bibliographical Society of the University of Virginia, bibliography, BSUVA, Hudibras, music, Psalms, psalters, Samuel butler, Sicily, student book collecting contest, U.Va. by David Whitesell. Bookmark the permalink.